I use my creative space just about every single day, even if sometimes it's only for an hour (although most the time it's a minimum of 8 hours). 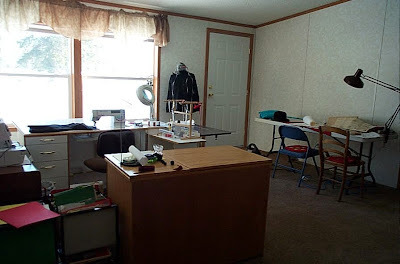 I have it set up with two machines I use regularly, one for leather and one serger, which I use on interiors, then there is the eye candy machine that I rarely use anymore (my Pfaff embroidery machine) and my 12 year old daughters machine. My favorite feature in my studio is the shelf that my brother-in-law built for my purses. It is built up a ramp that takes up part of the floor space in my studio and is such a creative use of this part of my space which I initially thought I would not be able to use. I have a couple "must haves" in my space. The obvious one is my machines, but over that I need-need-need my iPod docking station (I have no other form of music or sound for that matter, unless I sing to myself) and I absolutely must have my electric hot water boiler. I consume like 40 cups of tea a day and don't know if I could survive with out it. I would love if the windows in my studio didn't lead out to the hallway where everybody enters the building, it would be much cooler if they gave me a nice view of the outside world (especially because the building my studio is in is on the Mississippi river in NE Minneapolis). My dream creative space would be wall to wall, floor to ceiling windows. I don't mind what size, I don't mind where it would be, whether in a major metropolitan area, which I enjoy, or surrounded by nature, as long as I have tons of natural light coming in. Sewing with upholstery grade leather is very different from any other materials I've used in the past. I store the leather folded length wise in a weird old filing cabinet I found that the drawers open and then slide out on (it's more like a shelf). I use an old machine that I inherited from a very good friends mother, it is a 'New Home' machine from the 70's and works awesome. This is when they made things 'built to last'. Essentially it works like an industrial machine, but is made for the home in a nice small and compact design. It is very heavy, primarily made of metal, and it will pound through leather without thinking twice (in that though it will also pound through fingers and thumbs without thinking twice). I have my studio set up so that I can roll my chair from step to step very easily. I go from my cutting table to my machine to my eyelet/rivet press in a sort of circle all day long. I keep some paintings in my studio that I love to look at. One of my daughter that I painted from a halloween picture when she dressed as a pirate one year, and one of my dad and aunt when they were just small children. I have magazines that I love looking through (Craft, Readymade, and a lot of metal magazines for when my husband comes to hang out). I also keep some fashion magazines, from foreign to obscure to high fashion, because I love looking at what purses are out there (and shoes too, even though my business has nothing to do with shoes, I just adore them). On one side of my leather cabinet I keep stickers from places I've bought at on Etsy and other stickers from places I like. When I come into my studio the first thing I do is put my music on. I then boil water for tea. These are very important steps and must not me missed!!! Anyway, my creative process is fairly organized. Normally I have my project in mind already and I get crackin' on it immediately. Sometimes when I am feeling a little more creative I will try something completely new with no real planning, but this has proven to be disastrous and wasteful multiple times, so I am trying to not work that way anymore. I have a sketch book with many designs in it and step by step instructions that even I don't understand sometimes (I always feel like it makes sense when I write it...). I try to stick with only a few different designs to work with for a while so that I can produce more without expending too much energy on trying to think new stuff up daily, plus when I 'retire' a design for a while I have a very difficult time figuring out how I made it when it comes to sewing it again, even with my 'notes', so I try to make a bunch of them when I initially think it up. The building my studio is in, is fantastic. It is at 1828 Marshall St NE in Minneapolis and has 26 units in it, which are not all full yet. There is an art gallery on the main floor (Spot Art Gallery) and another gallery I've still to investigate that seems to have sort of screen printed rock posters. The building is deceptively huge and goes right back to the river, where we have a little courtyard deal with bbq's for the summer, a garden anyone in the building can work on and a fire pit at the beach. Awesome community to belong to. 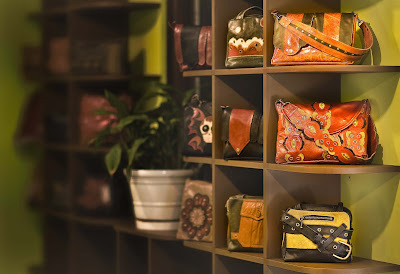 I am open by appointment for anyone that wants to see my bags in person (I can be reached at pursecution@gmail.com or (612) 298-6634) and my whole building is open for Art-A-Whirl (we got a star on the map, yay), so stop by and see some cool stuff! 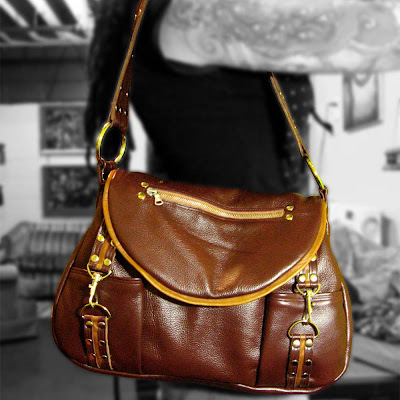 "A sassy, strong and uniquely practical purse, this bag is perfect to take traveling yet fashionable enough to use around town. The interior features a divider and a small pocket, there is a pocket in the flap and two pockets on the front, large enough for cell or ipod/mp3. The top opening measures 12" across, while the widest point at the bottom gets up to 16". The sides and bottom are 3" deep, and the purse itself is 10.5" tall. A small difference from my other bags also, this bag has nickel plated hardware rather than my usual antique brass". Awoke yesterday to over a foot of snow. At first light slogged through drifts over my knees to check on pregnant cows - don't want to loose newborns in deep snow. Thankfully all was well in the maternity corral. Just a winded and wet human on the return to house and hearth. Hurray hurrah, was just in time to capture a treasury on Etsy. Quickly came up with the title "Orange You Sweet" recalling the number of compliments new team member Liebling Art Crafts received on her orange crush ear rings. 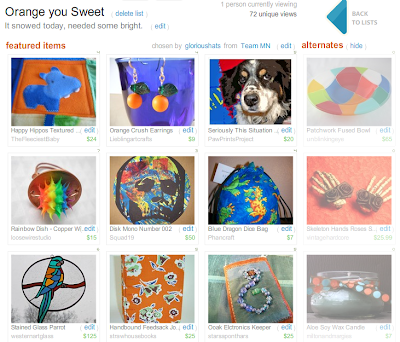 "Orange You Sweet" will be active and available on the Etsy Treasury site until Monday, April 28, 2008 at 11:o3 am EDT. Here you see a non-clickable screen shot of the entire treasury. The faded photos don't show on the active one. Those are the "in waiting" photos to fill in spots if items in the active treasury sell or go inactive. 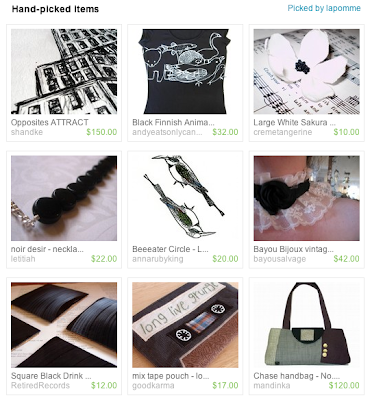 All but 3 of the items in this treasury collection are from TeamMN members. In a perfect world (meaning the most available space) my booth utilizes two 10' tables, two book shelves a small cabinet and a tiny wood TV tray for my cutter and laptop. Signage either suspended on wires from ceiling or on easels. What’s your favorite and/or least favorite feature in your booth? My least favorite feature? Hmmm…… I guess the TV tray I use for my cutter. I have not figured out a way to move in a full size desk…yet! Ha-ha. What is your dream display? I would love to be able to invest in some of those great wire racks to hang prima product so that customers would be able to see more of what I have. There are literally thousands of varieties and it can be very overwhelming if it is too cluttered. Are there any displays you would or wouldn't recommend using? I always recommend going vertical. There is always restrictions at shows how far you can go to the right, left, front and back but never up. So go UP! Any tips or tricks to your booth you would care to share? 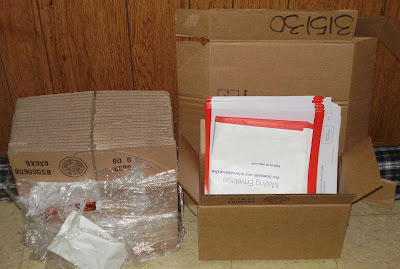 I think it is essential to pre-set up, then box and label everything so you can pull items from back stock easily. Oh and bring lights if you can. Proper signage and pricing is very very important. 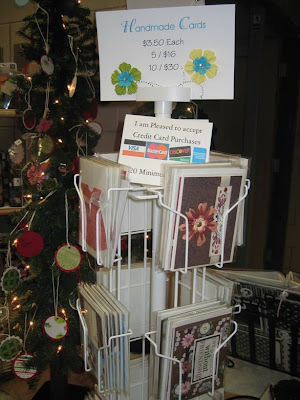 Greeting cards, gift tags on lit trees, and pre-made scrapbook album in background. Don’t loose faith~ every artist has their show, the trick is finding yours! Found on Minnesota Materials Blog April 21, 2008. An article Five Ways to Celebrate Earth Day the Minnesota Way Green grocery bags by Sara of Luna Feliz and Cloth Towel by Allison of ARTitecture. Bravo to Sara and Allison who know how to make green beautiful and joyful. Luna Feliz offers a variety of multi-purpose tote bags that are completely machine wash/tumble dry and they don't fall apart after a few uses. This is a bag you can plan on having for a long time not only for grocery shopping, but for anything - the beach, books, and diapers! They are also fashionable so being "green" can be beautiful. 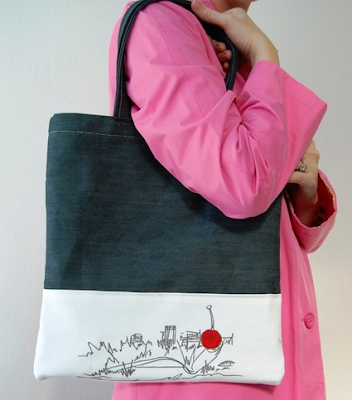 ARTitecture offers hand painted cloth tea towels and napkins, as well as tote bags. Imagine a picnic in the park with these coordinated pieces. Or carry lunch to work with flair. Found on Indie Public April 22, 2008. More info in the Cozy Corset Cuff Blog. Three cheers to Jenna and Chelsey. Reflect your personality while protecting your hands. The Cozy Corset Cuff is reusable, reversible, and adjustable to fit your mood on any given day. The Cozy Corset Cuff is a joint effort by Jenna and Chelsey; both have brought their ideas and visions to create this unique coffee cozy. 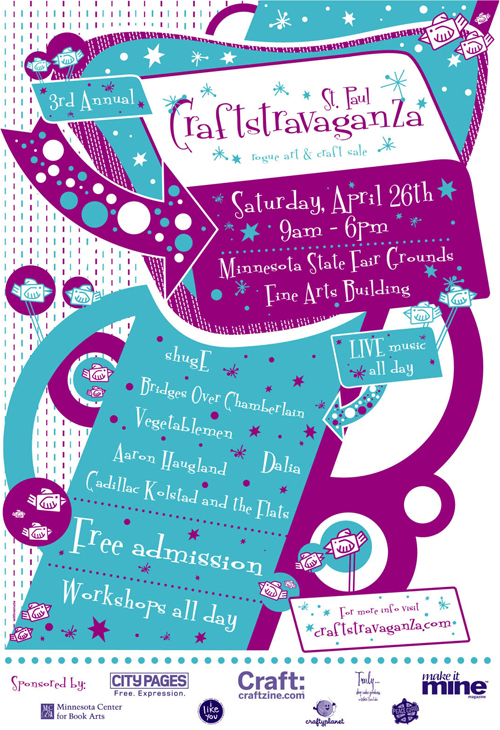 They have been creating independently for years, and met through the Etsy MN Street Team. They’ve been putting their heads together to come up with crazy and fantastic ideas ever since. How you use your creative space. My creative space is where I store everything I need to work on my candles and where I complete all the work. Your most favorite feature in your creative space. My favorite feature is my ribbon dowel. It's really convenient to have most of my ribbons in plain view (then I don't forget what I have) and in an easy-to-access place (I don't have to clean anything up). Name your "must-have" item in your creative space. My must-have item is my little electric, portable burner. Without it I would still be completely taking over the kitchen with my candle making. If I could change anything about my creative space, I would add an actual stove so I could work on more than one batch of candles at a time. It would be a gas stove so I could control the temperature better, as well. I would also add a really long counter that I could keep candles that are ready to go on, increasing my work space. My dream creative space would be some sort of loft area in the attic of my future dream house. 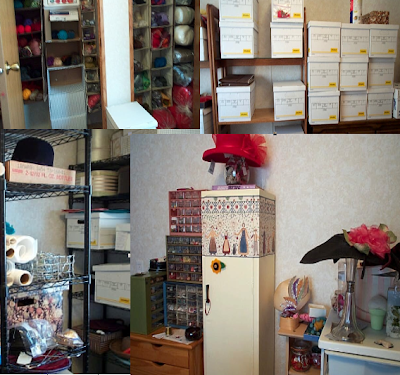 It would be spacious, have the above-mentioned stove, have tons of shelving for storing jars and finished candles, have a nice hutch to keep all my scents and dyes in, and have a designated packing and shipping area, which my creative space currently lacks. It would also not include my dog, who likes to knock everything in her path over and steal ribbon and paper towels. Describe what inspirational items you keep in your creative space. I keep clippings of cute candle decorating ideas in a folder in my creative space that I refer to when I want to stop doing the same things over and over. I also keep clippings on a bulletin board of business card and advertising examples. I have a book that inspires me, business-wise, called Crafting a Business, Make Money Doing What You Love. I have a ton of other books on crafting, not necessarily on candle making, that inspire my creativity. Many of them are 1970s sewing books from my mom or a thrift store. If I see a candle or soap that has a really unique scent, I will try to create something like it. Or if there is a smell in nature (like grass, cedar, etc.) that I really like, I will try to find an oil to match it. Do you have a step-by-step process? I first choose which jars I want to use from my empty jar shelf, depending on what size I want to make. I then choose the appropriate wick size for the jar, and glue the wicks to the bottom of the jars and let them dry for about an hour. (I often do a bunch of these at one time, so the drying process doesn't interrupt my candle making. Then I choose the color and scent I want to use for the candles. Then I melt two pounds of wax on my portable burner, add the dye, add the scent, and pour it in the containers. Once the candles have completely dried, I decorate them with ribbons, lace, rick rack, pom poms, or decopage, and put them on the "finished candles shelf." If there are any imperfections (like cracks or bubbles) on the top of the candle I use a igniter lighter (for a lack of a better word) to melt and smooth the wax. Is your creative process sporadic? The actual process of making candles is not very sporadic, but it is sporadic in what colors and scents I use, because I am getting new and different ones all the time. I have some tried-and-true favorites that I regularly make, but I mostly like to experiment with new scents. 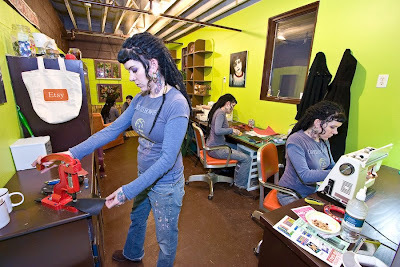 Another Great Picture of Jess’s Creative Space! 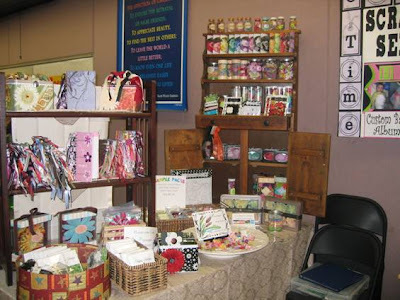 Lots of us like to look for great handmade items online but at the same time want to spend our hard earned dollars within our home towns, region or state. Some days you want to avoid the streets, or to shop at 1 a.m., or stay in your pajamas? Or maybe you have waited until the last minute and need to find a unique gift that will get to you fast. When when the search box comes up, type in the name of the town, area ; or MN or Minnesota. 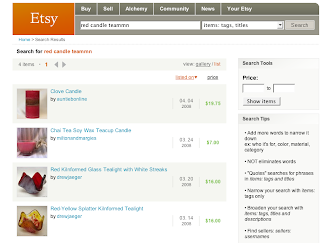 Need more info or have questions this article from Etsy online news may help TechUpdates: Shop Local . 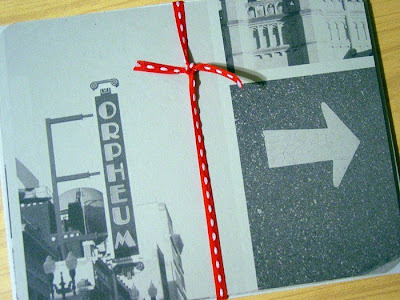 More ways to find MN Etsy Street Team members exist right here in our blog. First off in the side column you see the "Handmade in Minnesota" Gallery which features items from different team members, each picture is an active link so clicking it will take you to the item on Etsy. Below the Gallery is a Links list, organized by the types of items you will find in each store. 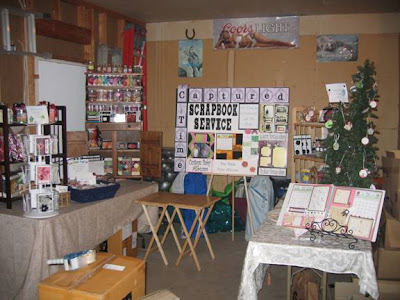 Want to see handcrafted items from Minnesotans, live, up close, and personal - below the shop links is a Show and Meeting Calendar. 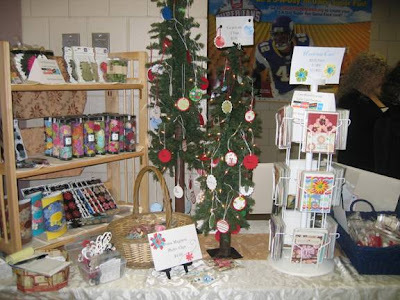 Find Craft Shows, Arts Events, Fests and Fetes listed there. Calendar postings will help you find the way. 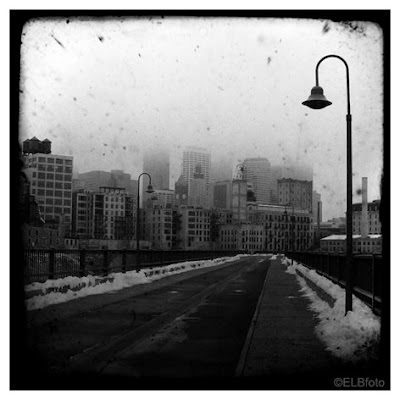 Last, but not least, tucked away at the very end of the blog page is the Etsy Minnesota Flickr Group link. Our team has many members also active on flickr , you will find fabulous new items showcased there. So scroll on down, check it out, enjoy the show. 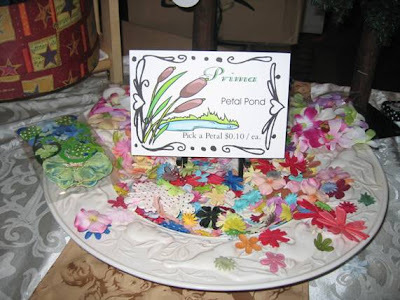 Chances are if it is handmade, there is a crafter or artist in Minnesota who makes it. 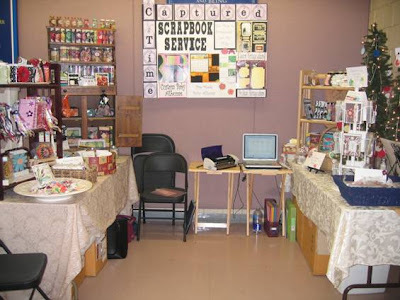 Craftstravaganza 2008 - Come See Us! 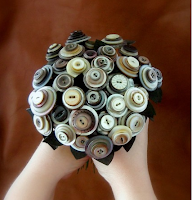 Lil Fishe's Button Flowers - Again - Hurray!! 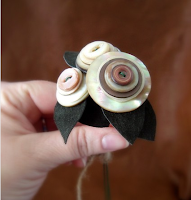 Besides being gorgeous to look at, the flowers are constructed with wire, vintage buttons, and recyled leather - no glue. So it all can come apart and be used as buttons once again. Light and bright is the key for me. It is wonderful to be at a stage in life where a true "studio" is possible. Two years ago, we moved a small modular home onto the farmstead and the whole building is mine. ALL MINE! 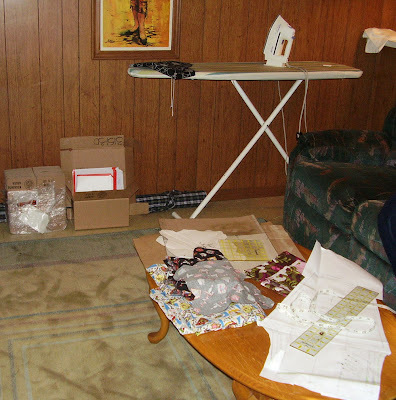 The "living room" became the sewing and work area. The three bedrooms are storage rooms. It is so lovely to be able to shut the doors and not see the boxes, shelves, etc. 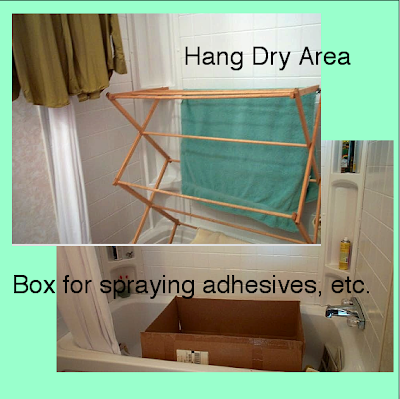 One bathroom tub is a hang dry area, the other is the place for spraying adhesives, stiffening agents, etc. If you could change one thing in your creative space, besides the size, what would it be? Please describe your dream creative space. Oh sure it would be nice to have every thing match, but hey eclectic works. The only thing needed is greater self discipline to organize and store neatly. Am really working on this and indeed have improved. My dream would be to have Oprah surprise me with a professional organizer to come and fix it all up- neat, tidy, labeled. Hang in, save your pennies, invest in good equipment as the years go along; a dream space can become reality. Being grounded, centered and rested enable me to focus intently on the projects. Bare walls, keeping it simple, and not obscenely messy - too much overwhelms me, is distracting. The view from the windows and MPR Classical station playing low are soothing. I had the great fortune and opportunity to go San Jose, California during the 1990s and take intensive sewing workshops with Bobbie Carr, she is always in my head while sewing. And her book remains the one most used and treasured. I so admire those who do sketch out ideas, hard as I try, that just does not work for me. 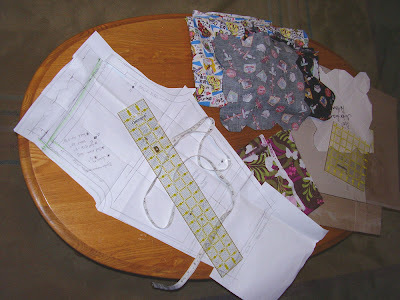 Ideas and concepts ruminate in my head, then progress and commingle with laying out fabrics, patterns, findings. Sometimes the creation changes as it progresses. Yikes, must I admit it? I listen to the fabric. It talks to me through my eyes and fingers. Really it does. 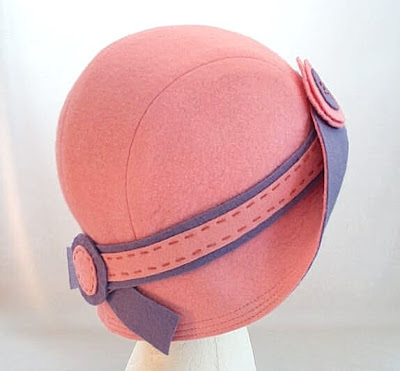 When one listens, interacts with suitable techniques; the fabric/fiber responds beautifully, going from flat and flaccid to three dimensional and shapely. That is all at once. 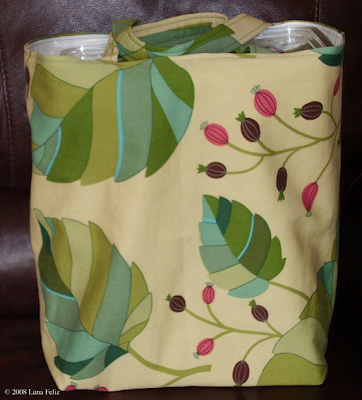 the fun, the challenge, the joy of creating with fabrics and fibers. My creative space has to be very versatile. I use it for pattern making, fabric cutting, sewing, pressing, packaging and shipping and most importantly brainstorming and catching up on Martha Stewart & Clean House. It also doubles as the half of our basement that isn't torn apart at the moment. Even though it's not a pretty space, it's mine and I when I'm not using it, I can close the basement door at the top of the steps and lock it to keep my kids from getting into anything they shouldn't. 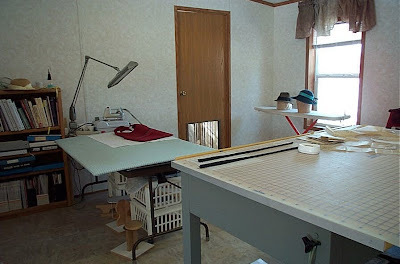 My most favorite feature in my creative space would be my little sewing desk that my husband hand built years ago for our PC. It's a beautiful little Shaker design. 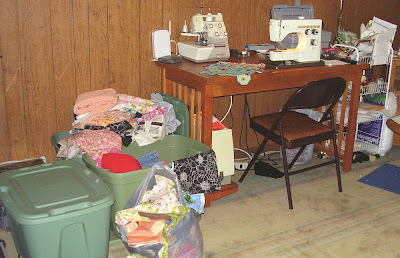 We've since converted to a Macintosh and the desk now works well for my sewing endeavors. My back-up Singer sewing machine fits nicely under the desk on the little built-in PC tower shelf. 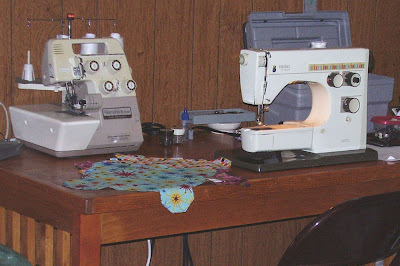 The must-have item in my creative space would have to be my 1970's Viking Husqvarna "work horse" sewing machine. I really love that thing. It can sew through just about anything. Maybe it’s a specific item you would like, like furniture, or a display case, etc. Big Windows for more natural light! Since my creative space is in our basement, it is what it is - a 1956 rambler basement with tiny windows sparsely spaced along the top edges and lots of dark wood paneling from the previous owner. Ooh, a big amazing cutting table in the center would be great! Although, it wouldn't fit at the moment. 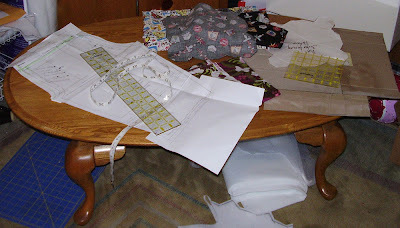 Right now I use a little coffee table for pattern making & cutting. As far as tips, once you see my space you will know that organization is not my strong point. But, I do know where everything is. One thing I must say as a seamstress/designer - never, ever underestimate your iron. You can design and sew the most fantastic product, but if you don't press the fabric, seams and corners with your iron during your process, it's not going to look half as good as it should. Signs? – Do you have a sign/s that are inspirational every time you seem it/them? Everyday life is inspiration for me. One day it could be the needlework that I have hanging in my sewing area from my husband's grandmother that just passed away last year at the young age of 94. She was an avid needlework crafter up until the time she passed. Other times I am inspired by nature or my children and some of the ideas they come up with for things they would like to have. Music always inspires me. It has always been my constant source of happiness, a natural mood booster. Hand-crafted item? 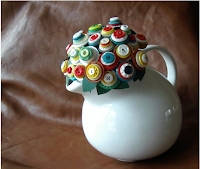 – Do you have a special handmade item, whether made by you or someone else, that inspires you? I know it may seem cheesy to say that my own items inspire me, but I make little fabric Chinese Take-Out boxes and they are all unique and different and I never tire of making them. They are really fun to create and it's fun to see people's reactions when I give them for gifts. Pictures? – Have you taken pictures of inspiration things, so when you look at them they inspire your creativity? Most of the pictures that inspire me are the ones that I've taken in nature. There is so much beauty around us in nature that I think is taken for granted. I appreciate little things. Intricate natural details in a snowflake or veins on a leaf inspire me. Clippings? – Do you save clippings of inspirational things that inspire you? Occasionally I will keep magazine tears of color combinations or fabric prints that inspire me. Books? – Do you have a special book/s that inspires you? I just picked up some new books at the library that I'm hoping will inspire me on Screen printing and how to turn your Craft into a business. My process is very sporadic since my actual crafting time is very limited with two little ones at home. One example: If I get an idea in my head while I am making my kids lunch I will sketch it out quickly on any free piece of paper I can find in my kitchen and then get back to it after they are in bed for the night. Do you start in one location and move to another? Most of my ideas start in my kitchen as a miniature sketch and then eventually I will start the pattern making process in the basement. And the rest of the process is usually finished there in the sewing area. Do you do all your crafts in one spot? No, kitchen, basement, living room are all free-game. Do you sketch your ideas out first? Most of the time, yes, in order to conceptualize the project fully. My creative space right now isn't ideal or pretty, but it's a temporary space until we can re-finish our basement. My husband has already talked about including a craft room for me in the new design. 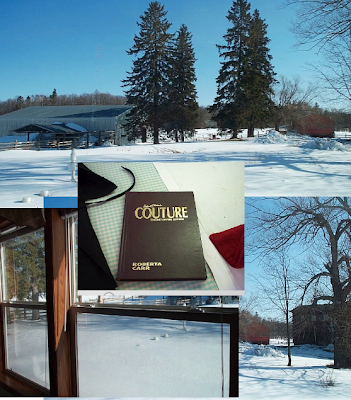 More Great Pictures of Sara’s Creative Space!